In 2016, I was chair of the Yes on Prop 1 campaign, in support of a property tax increase for city services. Prop 1 comes directly from the Shoreline 2011 Pedestrian System Plan with the unimaginative goal of sidewalks on vehicle arterials every five blocks. But the 2018 Citizen Satisfaction Survey shows 37% of respondents want sidewalks in their neighborhoods. Only 24% want sidewalks on major streets. Prop 1 would collect $59,000,000 for 4.2 miles of new sidewalk, with $17,000,000 going to interest payments and other debt expenses we’d pay off until 2039. Of course cities can use taxes to repay debt for big projects - Seattle’s Safeco stadium is a recent example. But are 4.2 miles of new sidewalks really our “stadium”? The projects haven’t been vetted. In their 10/03/18 op-ed, People for Shoreline Sidewalks showcase a need for sidewalks to connect the bus stops on the east side of Meridian Avenue N. The estimated cost for this project is $3,451,000. 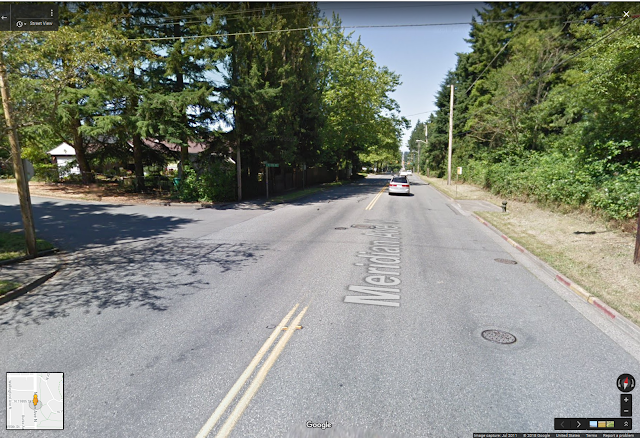 But a crosswalk costing $7,000 would connect this bus stop to the existing sidewalk on the street’s west side, and a path could connect it with the Interurban Trail just steps away through the trees on the east side. The sidewalk project on 15th Ave NE in Ridgecrest is similarly unjustified. The project on 5th Ave NE, in the heart of the 185th Street Station Subarea, could be torn up during redevelopment before it’s paid off. The Shoreline ADA Transition Plan is a current separate effort to fix sidewalks using an additional $20 car tab fee. Sidewalk fixing and updating is much cheaper than new construction, and we should fix what we have first. Learn more about Prop 1, and maybe purchase one of our small batch local artisan yard signs, at shorelinesidewalksplan.org. If you, like me, are reluctant to vote no because you’re not anti-tax but you want a better plan, vote no and send your two cents to City Council at council@shoreline.gov. Because if Prop 1 passes, it’s set in stone. Thank you. I will vote no. Not voting for one more Shoreline initiative until the density tax break is revoked. I feel sorry for all of you people who believed the city's lies and smears about *why* people were upset about the upzoning and mistrust of Sound Transit. ST made all these promises about improvements in the light rail subareas and then after they got what they wanted (massive upzoning) they went back on their word. Now all of sudden they have all of this money for the 130th St station. I hope your eyes are starting to open. Nicely articulated. We should make the existing sidewalk on 15th Ave NE functional before we embark on anything new - tree roots have buckled large sections, creating significant tripping hazards and making wheelchair use difficult. After seeing how much money was wasted on the plantings in the middle of Aurora which have turned to weed forests, I'm extremely reluctant to hand over more of my money to pay for sidewalks. Thank you for your comments, Megan. I served with Megan and Dustin on the No on Prop 1 campaign to write the "no" statement for the Voters Pamphlet and now continue to be part of the No on Prop 1 campaign. If you read the many signs that have been posted all over Shoreline, your first thought might be, yes, we need more sidewalks. However, Prop 1 would only add 4.2 miles of new sidewalks over a period of 20 years. That is because new sidewalks cost approximately $2,500,000 per mile, but sidewalk repairs and upgrades cost up to $195,000 per mile. When you look around, doesn't it seem like we should concentrate on fixing the sidewalks that we already have first? Learn more about Prop 1 from the website, shorelinesidewalksplan.org before you vote. I too, plan to vote NO on the sidewalk issue. The worst sidewalk in Shoreline was not even on their repair list. Don't need to raise my taxes anymore than then already have been. While I appreciate a good revolt, as the author of this op-ed I want to make clear that I'm not a part of the revolt against light rail. Much of it is water under the bridge. If anything, I would like the City to make small but smart investments near light rail rezones in existing older neighborhood centers to preserve character and enhance neighborhood businesses, which in turn attracts higher quality developers in the rezones. If it's going to happen, we might as well make the best of it, rather than leave it up to chance. In particular, the intersection at 145th and 15th needs City investment in the ROW and placemaking. And the small business area at 165th and 5th in Ridgecrest badly needs sidewalk repair and crosswalk repainting. A little investment in these areas would go a long way to show that City Hall cares about how Ridgecrest is affected after the City created a blank slate in the south end of it. But instead, Prop 1 offers us a long, expensive second sidewalk along the east side of the arterial of 15th Ave NE, where few people walk or want to walk. There are bus stops on that side, but people use crosswalks across 15th to access the neighborhoods to the west. There's nothing but vacant property and chain link fence to the east. This project is the only project proposed in the SE quadrant of the City. The NW and NE quadrants each get 3 or more projects. Other projects are similarly boondoggly since they were not vetted properly by staff, Council or the Sidewalk Advisory Committee. They simply weren't scrutinized on a project by project basis after going through a basic ranking exercise. This may be difficult to believe, or maybe it isn't, but it's true. I've pointed this out to City Staff in meetings and they seem to understand. But the projects are set in stone in Prop 1, so their hands are tied. Come to the second Prop 1 meeting at the Shoreline Library this Thursday. I'll be there. I was at the one last Thursday, and it was just four residents and three City staff. Let's make it a party this week. Opposing sidewalks is great if you're able-bodied and can walk on mud or grass; for those of us with small children who need to be able to safely get to bus stops and where we want to go, or people with mobility issues, they're pretty important. And they're expensive to do right, but I'd rather spend money on things that are important rather than waste it like Seattle does on stadiums. Finally, "fixing what we have" is great if you live on a street with sidewalks already. As the article notes, the city is looking to fix those. But people not fortunate enough to live in parts of the city without them deserve mobility, too. Shoreline is growing, just the like the rest of the Puget Sound area. Our pedestrian walkways are already insufficient and not able to help people walk safely through our city. The argument that we should go back to the drawing board continue to wait to take action on building new sidewalks is insufficient to me. We need to take action. Now. I live on Ashworth - a high priority street in the sidewalk plan - and have two young children. While I'd love for my street to be the first to get sidewalks (as I'm sure everyone would prioritize their street first), inaction now will just prolong the time I wait. My family should be able to walk to the store or school without fear of being mowed down by a car. The campaign against sidewalks fails to offer a timeline for action - just more discussion (even after a year of talking to citizen representatives). Over 23 years of 'city-hood' Shoreline has only been able to add 22 miles of sidewalks. I'm tired of waiting and will be voting yes for Prop 1.